Unlock every child’s potential as a unique child of God. Our aim is to ensure that every child’s unique strengths are celebrated and strengthened alongside gaining an excellent academic, social, emotional and physical education. "School leaders set very high expectations which result in excellent outcomes. This is the result of the ways in which all members of the school community live out their core Christian values. There is a generosity of spirit across the school which can be seen in many practical examples in daily life and also in ways which reach out to those in need beyond the school. A clear focus on reflection both for learning and for living means that pupils are encouraged to develop very well spiritually, morally and socially. Pupils demonstrate a clear understanding of the importance of religious education (RE). This helps them to understand those with different beliefs and the importance of living well with each other now and in the future. There is a wholehearted commitment by staff and governors to wanting the best for all pupils. This has resulted in academic excellence balanced with humility, responsibility and respect." To read the full report, follow the link below. In October, we welcomed Mrs Naeem to our worship. She gave the children a very informative talk about her Islam faith using a power point and artefacts to help the children understand. Having visited many schools, she commented several times about how impressed she was with the children's knowledge of both Islam and Christianity. 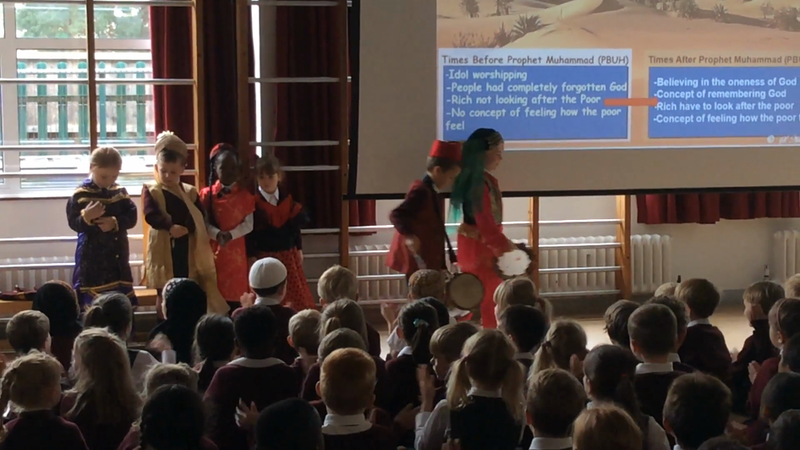 The children enjoyed having the opportunity to dress in traditional head coverings and clothes as well as beating a special drum the way Muslims do when celebrating Eid at the end of Ramadan.